Foremost, I'd like to give a huge thanks to Tracy B. and Mr. Gimmick for their contributions. Tracy: Thank you for your invaluable contribution to the Silent Hill community. Where many people would never present a reasonable opportunity to share and enlighten others, you have. Mr. Gimmick: Thank you for your act of selflessness and putting a tremendous amount of faith in me to be able to document the contents of this disc so that others may also read and learn more about this game we all love. This article would not have been possible without the two of you. Thank you. When you see a disc labeled Silent Hill 2 you know it's something special. When you see a Silent Hill 2 disc that also has "Version 0.10" on it you know it's something great. 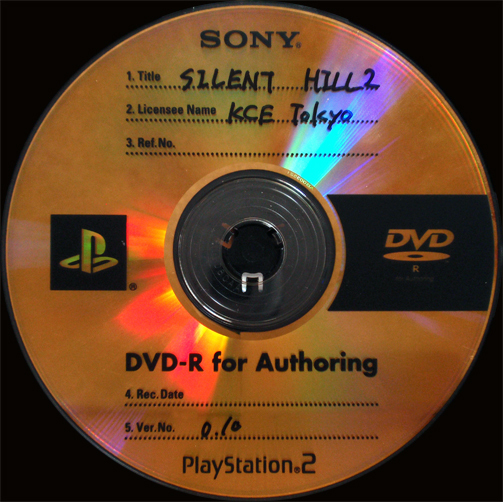 This article will cover the contents on said disc along with noting differences in it compared to the final release of Silent Hill 2. A couple things to note off bat: Silent Hill 2 Ver. 0.10 (known as SH2V.10 from now on) is only playable up to the point where you are about to fight Pyramid Head in the apartment stairway. Also, in this version, James does not comment about anything within the environment. The majority of visuals (models and textures) are no different in this build--items, camera angles and text/subtitles are the greatest change. One of my favorite pre-release alteration is still intact on this build. The sign says "WELLCOM!" (instead of its later version, "WELCOME! ").